Searching for some inspirational Ramadan quotes, sayings and wishes. If your answer is "yes", then you don't have to search for them anymore. As here I have compiled down some of the best Ramadan quotes, sayings and wishes for you. Just hope you will like the quote compilation and able to find some good words to express your feelings. Do not turn your face from others with pride, nor walk arrogantly on earth. Verily the Almighty does not like those who are arrogant and boastful. We are nearer to him than his jugular vein. Fasting is a shield with which a servant protects himself from the fire. 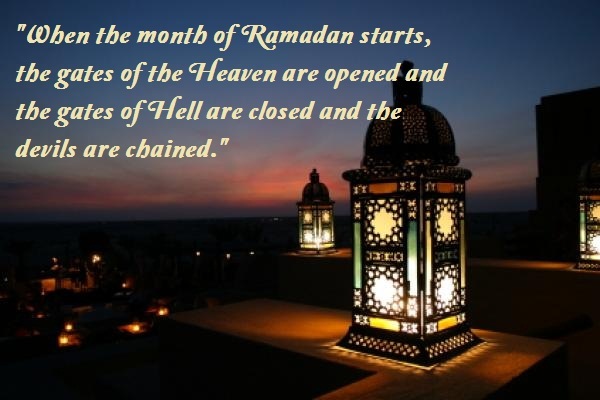 When the month of Ramadan starts, the gates of the Heave are opened and the gates of Hell are closed and the devils are chained. As the cresent moon is sighted... And the holy month of Ramadan begins.. May Allah bless you with happiness and grace your home with warmth & peace!! Read in the name of your Allah who created. He created man from a clot.Read and your Allah is Most Honorable, Who taught (to write) with the pen. Taught man what he knew not. Allah causes the night and the day to succeed each other. Truly, in these things is indeed a lesson for those who have insight. and judgment between right and wrong. Ramadan is the month of blessings ... And I am sure you all get share too.... Because Allah is happy with you! Peace be upon you, for you have persevered! How excellent, then, this fulfilment in the hereafter! I wish this Ramadan, you are gifted with blessings of Allah and many treasured moments of joy! Wishing you one month of Ramadan, four weeks of barkat, thirty days of forgiveness, seven hundred twenty hours of guidance, forty three thousand two hundreds minutes of purification, twenty five lakhs ninty two thousand seconds of Noor..!! Wishing that Allah always blesses family with smiles, happiness and togetherness..!